We received these stamps as a Christmas gift this year and they are awesome! They allow us to build the fine motor skill of stamping while talking about and modeling different situations that might result in different feelings. We are definitely going to be using these in an upcoming My Obstacle Course, primarily because Andrew asked me just the other day, “Can you have hurt feelings?” He had been sick with the flu and then got an ear infection so we have been talking about hurt tummies, ears and aches of all sorts. I thought it was a cute question but also showed me that he is thinking about feelings. 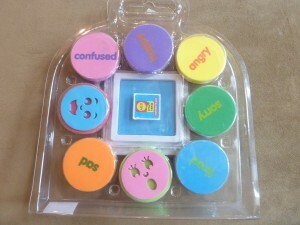 My Obstacle Course Station Activity: Read the situation and stamp how you would feel. Write out a brief situation that your child might encounter during the day. When they get to the station, read the situation with them and talk about how they might feel. Have them find the stamp that matches what they would feel. Stamp the feeling on the situation card. Show with your face how you would look if you felt that way. 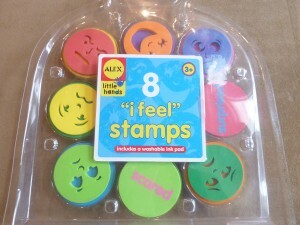 Use the stamps to illustrate a story (Character series books like “Franklin” or “Arthur” books are good because they usually have some sort of situation that frustrates them before they figure out how to resolve it.). Provide a clean sheet of paper and as you read through the story, stamp the emotions that the characters might be feeling. Make your own story showing how one can go from an angry situation to resolving it and being happy. This would help to illustrate that one’s emotions aren’t set in stone and that feelings can change as one’s thoughts about what is happening or what has happened changes. Social stories and activities like these help children to have knowledge about feelings they may experience and also allows you to model appropriate ways of handling emotions and resolving issues. It shows them that it’s okay to feel a certain way but gives them an opportunity to work through those feelings in a safe, pretend way so they are better equipped when it actually happens.